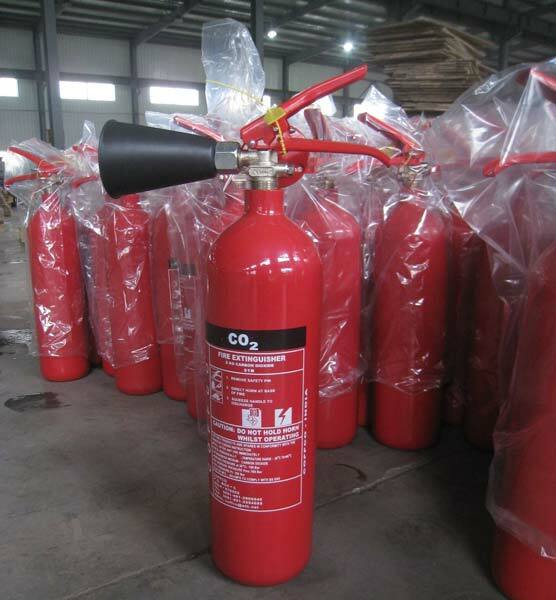 We synthesize CO2 fire extinguisher which is renowned all over the world because of its premium quality and easy usage. It falls in the category of most trust worthy products. The designs of these extinguishers’ are made in such a way that they are easy to use at the time of emergency. We have a specific lab for checking and examine the efficiency of carbon dioxide fire extinguisher. Most proficient team is deployed in the production of this product. With all this we are major CO2 extinguishers suppliers. COFFCO can offer wide range of CO2 Fire Extinguishers. The CO2 Fire Extinguisher, we offer, are all manufactured to the strict requirements of the appropriate standards and are warranted against defects for certain period providing they are installed and maintained in accordance with the relevant standards. CO2 Fire Extinguishers are very effective on Class B, Class C and Electrical fires. It is electrically non-conductive and does not leave any residual after discharge into the fire, most suitable for fighting fire on electrical equipments. CO2 Fire Extinguishers are generally used for industrial fires. 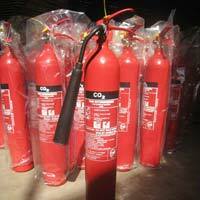 CO2 Fire Extinguishers are made of seamless carbon steel to withstand high storage pressure. CO2 gas is an electrically non-conductive and therefore safe for fighting fires in electrically powered equipment. CO2 is colorless gas, which is heavier than air. CO2 Fire Extinguishers are manufactured according to BS EN3 & ISO 9002 Standards. Application of CO2 Fire Extinguishers includes Food Storage area, Processing plants, Transformer stations, Telephone equipment, Chemical plants, Laboratories, etc. CO2 Fire Extinguishers are available in Black and Red color. Other capacity of cylinders can be supplied upon request. 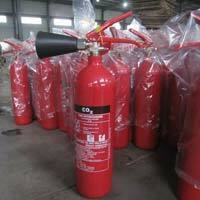 CO2 Fire Extinguishers on trolley are made of seamless carbon steel to withstand high storage pressure. CO2 Fire Extinguishers are very effective on Class B, Class C and Electrical fires. It is electrically non-conductive and does not leave any residual after discharge into the fire, most suitable for fighting fire on electrical equipments. 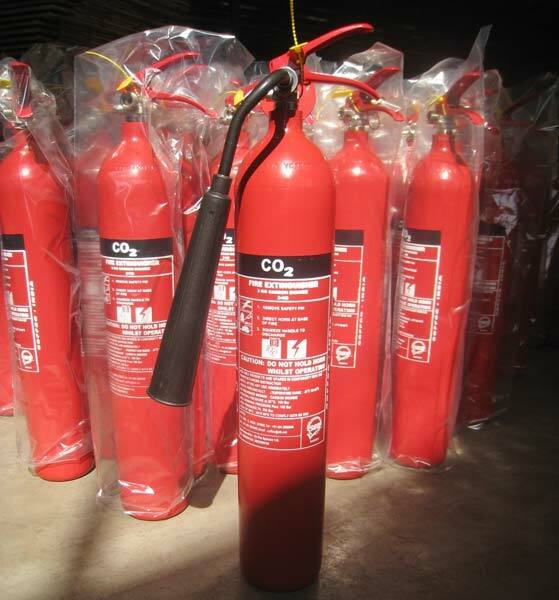 CO2 Fire Extinguishers are generally used for industrial fires. CO2 Fire Extinguishers on Trolley is used throughout industry as a protection against industrial fires involving dangerous chemical and gas. CO2 gas does not deteriorate with storage or freeze in the container. CO2 is colorless gas, which is heavier than air. CO2 Fire Extinguishers on trolley are manufactured according to BSEN3 & ISO 9002 Standards. CO2 Fire Extinguishers trolley types are available in Black and Red color. Other capacity of cylinders can be supplied upon request.